"We often forget that WE ARE NATURE. Nature is not something separate from us. So when we say that we have lost our connection to nature, we've lost our connection to ourselves"
Since primitive man first illustrated streaks of rain and lightning on the interior walls of their cave homes, artists have been entranced with depicting our natural environment. Yet, for centuries, the landscape's appearance in art was meant to construe either awe for our natural world, or as a background subject for the documentation of human narratives. In the 20th century, alongside rising global concerns surrounding the state of the environment's health, and our impact as humans upon it, many artists started creating works in collaboration with the physical world to draw attention to ecological issues as well our relationship and contribution to them. As a more defined concept, Environmental art has gained more traction since the 1990s when artists began to think about their surroundings not just in terms of lived or built space, but as a cohesive system in which humans have a central part to play. Environmental artists seek to investigate our human relationship with the environment through embedding their artistic practice within it. This changes the way we think about the site of artistic production; as opposed to using the artist's studio as the sole location in which to create, Environmental artists engage the natural world in a much more active and immediate way either by working in new ways outside, or by bringing natural materials into new settings. Environmental artists aim to work in harmony with the natural environment rather than disrupt it. This means they deeply consider the impact that they as individuals have on nature and do not sacrifice its health or wellbeing in order to create work. Moreover, by working in collaboration with organic landscapes, Environmental artists fall subject to the uncontrollable cycles of the seasons with their processes of flowering, erosion, molding, and decay. Environmental artists often use natural materials such as leaves, flowers, branches, ice, soil, sand, stone, and water as the very basis of their artwork. Moreover, in choosing to situate their work in specific places, Environment art often seeks to both transform the way that the site is viewed, whilst also revealing what was already there. This demands that viewers and audiences rethink how they "see" the world around them and pay more direct attention to the minute and distinct parts that make up what we may overlook as a cohesive environment. Evolving from Land Art, Environmental art also rethinks the importance of the exhibition space and seeks other places where art can happen and where art can exist. This form of Institutional Critique seeks to question the authority and power of museums and galleries that have historically controlled the production, sale, and viewing of art works. By looking for new and sometimes unique and surprising locations, artists not only remove the power from high-powered art-dealers, buyers, and from the art-market in general, but also question the need for an audience (and art buyers) at all. Instead, artists emphasise the birth of the idea and the process of creation, without insisting that the work needs to be seen by many people, or indeed by anyone at all. Environmental art, also known as ecological art, encompasses several different forms and practices that engage with, and represent the environment. It is distinct in its less specific time period and greater scope of art. As Professor John E. Thornes noted, "Environmental art is [...] a new genre to describe works of art that are not only directly representational of the environment (the 19th century wonders such as John Constable's Cloud Series, Claude Monet's London Series, or Paul Cézanne's Mont Sainte Victoire Series), but also works of art that are clearly nonrepresentational and performative in terms of much less direct interpretation but more active engagement of the audience such as Richard Long's A Line Made by Walking or James Turrell's Skyspaces. Betty Beaumont's work is deeply socially conscious, often actively highlighting sustainability and engaging with contemporary issues. In creating this piece, Beaumont was looking for a way to take waste material from a power plant and transform it into something that would actively benefit the environment. She collaborated with a team of scientists in order to create the work that lies to this day in the Atlantic Ocean, 40 miles away from New York Harbor. By taking coal waste and reforming it into inert blocks, Beaumont was able to fashion what has become an artificial reef, deep under the sea. Though viewers are unable to view the piece because of its location, New York University's Interactive Telecommunications Program created a virtual reality experience of the sculpture in 2000. The installation is apparently a fish haven, as described by the National Oceanographic and Atmospheric Administration. The work asks profound questions about the possibilities of Conceptual art to have a positive impact on the environment. In Beaumont's preparatory work with scientists and engineers in this piece, she showed how integrated her artistic practice is with environmental science as well as experimental ecology. By fusing art and art practice with science, she broke down the divide between the different disciplines and suggested new cross-discipline modes of working, particularly in the solving of pressing problems such as the repurposing and recycling of waste from industry. Moreover, in placing her work under the sea, she considered problems between a passive and active response in her viewers: how can we respond to this work as an aesthetic object or as an example of activism? Andy Goldsworthy is famed for his celebration of organic pattern, shape, and texture in his site-specific works that explore the inherent beauty of the environment, the inevitable cycles of rebirth and decay, and co-creation between man and natural material. He has commented that he sees his work as "collaboration with nature." In this example, we see this union through his profound appreciation with what nature has to offer to anyone who takes the time to look closely. For four years, Goldsworthy lived in Cumbria in North West England, and worked on creating these limestone shapes while employed in the area as a gardener. He carefully selected local limestone, and stacked the shards up into a cone shape, each one unique. He noted, "I am fascinated by the way a cone grows, stone upon stone, layer by layer - as a tree does, ring upon ring. By making slight changes in the placing of each stone, the shape can be brought out or taken in, made elegant or squat, full or empty." For each cone Goldsworthy created a singular shape, informed by the natural curves and points of the stones themselves. The work was created in specific dialogue with the nearby "Nine Standards," which are nine cairns that have sat on a hill for several centuries, with origins that are unknown. Goldsworthy wanted his pieces to respond to these ancient structures, making a link between old and new. In mimicking the shape and material of the older cairns, Goldsworthy suggested that using natural materials to build is an ancient, inherent, human impulse. He demonstrated the longevity of stone through his creations, which indicate that, like the "Nine Standards" they, too, may last several hundred years. Although the work could not be bought or sold, it lent a special message toward viewers, that they too, could build their own versions of ancient artifacts and in fact, add to the idea of geographical heritage. Hungarian-American Agnes Denes is one of the best-known Environmental artists, producing work that pushes the boundaries of what art can be, crossing over into other disciplines such as activism. This piece is one of her most famous, and extremely ambitious works. With the help of several volunteers, Denes planted a two-acre wheat field in a landfill in Lower Manhattan. The ground was prepared with soil, planted with wheat, and then harvested. The piece survived for three months. The location was of central importance to this work. At that moment in time, the site was totally barren and not yet developed as it is today (now it is home to the Battery Park City neighborhood), making it the perfect urban wasteland to revitalize. But there are also other significant details about the site, as writer Karrie Jacobs comments, "The work seemed to stare down the World Trade Center, one of New York's significant symbols of power, and force the viewer to confront difficult questions [...] on the divide between rich and poor, between the pastoral and the technocratic, and how people embrace progress." Though her attraction to sites of urban decay may recall Robert Smithson's work, the transitory nature of the work means that rather than making a permanent mark upon the land, Denes's work is only recalled in memory, in photography, or by word of mouth. Meg Webster often brings gardens, flowers, and plants into the gallery space. But these works are not merely replicating the English country garden or the feel of a flower show. Instead, through the use of lights, heat, and organic material, she actively changes the ambient temperature of the gallery with her recreations of ecosystems. In this piece, we see the influence of Minimalism in its simple presentation of a rounded rectangle of peat moss and soil. The materials from which it is made are the very building blocks of our lives as they provide the basic starting points for plants, which feed us and other living things. Though this point may sound obvious, by shaping this natural material in such an understated way, Webster exposes the underlying, ever-present magic of the natural processes that unobtrusively take place perpetually all around us. Yet, by bringing it into the gallery setting, she was also able to emphasize its importance and invited viewers to consider something ordinarily ignored as something worthy of being art. Moreover, by using the soil, with its distinct smell and look, she reminded viewers that nature is not just something to be looked at, but is also a tactile presence. Icelandic-Danish artist Olafur Eliasson has produced several works, which directly harness the power of the weather as a means of adding a new experiential element to the aesthetic encounter. Often using light and water, Eliasson is interested in dissolving the boundary between the inside and the outside through our body's reception to the key elements that make up life on earth. The Weather Project is made from hundreds of yellow lamps attached to the wall in a half sun formation. This half sun is then reflected by mirrored foil on the ceiling, making it appear as a full glowing orb. The huge room is then sprayed with mist so that viewers move through the space they become slightly damp, as if moving through the London fog. Eliasson used mono-frequency lamps, so that only black and yellow become visible, lending to an experience akin to walking through the shadows. In recreating the weather inside, Eliasson highlighted the way we normally experience the weather as a mere background element in our lives. Though the weather may have an impact on our ability to enjoy certain activities, it is normally considered only in terms of its effects on us rather than on its own terms, as an equally alive entity. This becomes particularly noticeable when living in a city. In past agrarian economies, humans lived in harmony with the weather and relied on it to sustain their way of life. Now for those who live in cities, perhaps it is merely a nuisance. Eliasson wanted the work to engage with this issue, saying "Every city mediates its own weather. As inhabitants, we have grown accustomed to the weather as mediated by the city." By making the weather an event in this famous metropolitan museum, he tries to abstract it from its context, allowing us to appreciate its complexities and nuances in a new way. Dutch natural scientist and artist herman de vries (who uses all lowercase letters in the spelling of his name) produced this work The Branches of Trees as part of his Catalogs of Nature series. Trained as a gardener and biologist, de vries brought his intimate knowledge of plants and nature to his work through collecting, cataloguing, and displaying a multiplicity of natural materials. For this piece, he meticulously collected and laid out different specimens of trees (and in other examples leaves and soil) in a formation reminiscent of Victorian taxonomic displays. Unlike those Victorian pieces, however, which labeled each specimen with the genus and species as well as its common name, here the artist leaves the examples to stand for themselves. While the Victorians may have aimed to document and explain nature, human language is absent from de vries' work. In fact, in the collected objects, we do not know what trees we are looking at, and indeed, we could be looking at the branches of some of the same tree. In doing this, vries demanded that the audience look and study the brilliant detail and pattern of each example, and avoid attempting to categorize or label. De vries aimed to engender an appreciation of nature that went far beyond mere education, and into another way of seeing the world around us. German artist Nils Udo is one of the most prolific Environmental artists, having started out in the 1960s and still working to this day. 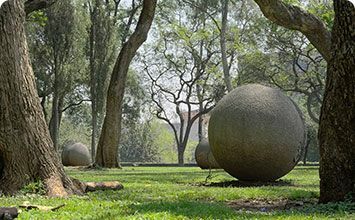 This enormous bird nest was built by Udo in the botanical gardens of Clemson University. Built with the help of students and volunteers, the installation was made using bamboo for the interior of the nest and pine for the exterior. It used 80-tons of locally sourced pine logs. The piece stood for two years, before its logs were turned into mulch to fill in the hole. Udo has built other nests such as his 1993 Bird's Nest, Eggs Formed in Ice, Coloured with Viburnum Fruit, made to scale with sticks and ice, or Winter Nest made entirely from sculpted snow. But for this gigantic nest, he drew attention to the labor and building skill that goes into a bird's nest. By harnessing the power of clay, normally a material used in building bricks for houses, he created a solid structure that suggested its own permanence. He juxtaposed this, however, with the use of untreated wood, which would invariably decay, mold, and change. The piece asked us to consider what we, as humans, emulate from nature, in our own world. Birds build with no regard to a guarantee of permanence in their homes. Even their residence is subject to the natural forces of climate and decay. We, on the other hand, favor building things for permanence. By paying attention to the birds' faith in the natural order of Mother Nature, whether it is constructive or destructive, we are encouraged to trust more in life's harmonious processes. Seattle photographer Chris Jordan's work is deeply engaged with the impact of mass consumption on the environment and nature. In this series of photographs, Jordan captured the immediate effects of plastic waste on the albatross population of Midway Atoll, a remote territory of the United States. In this photograph, Jordon has cut open the stomach of a dead albatross chick to expose the plastic rubbish that it has eaten, fed accidentally by its parents who have mistaken the trash, floating in the vastly polluted Pacific Ocean, for food. The body of the albatross is still recognizable as we can see its beak, eyes, and feathers. But Jordan has laid out the pieces of toxic plastic in colorful juxtaposition to the mute colors of the baby bird offering a glimpse of the harmful effects of ignorance and negligence on innocence. The albatross carcass also exposes how insidious the climate crisis truly is, as he states, "Like the albatross, we first-world humans find ourselves lacking the ability to discern anymore what is nourishing from what is toxic to our lives and our spirits."